Going vegan wasn’t as easy as suddenly refusing to eat meat and animal products, and I had to actively watch what I was eating. A week into my lifestyle, I realized that my attempts to avoid animal products were failing when I was told the pasta I was eating had eggs in it. Shortly after, I did my research and found how people transitioned into eating vegan food and learned about vegan substitutes, including for pasta dishes. Out of all these, my favorite is the spaghetti squash, a delicious but low-calorie substitute for regular pasta. In this article, I talk about eating healthy vegan substitutes to regular food, how many calories are in a serving of spaghetti squash, and some of the best recipes I’ve tried for a great spaghetti squash dish. Just a quick run-through on the terms since we’re talking about veganism. Veganism is often mixed up with vegetarianism and so many other dietary subsets, though some of them do tend to overlap. A vegetarian doesn’t eat meat and animal products, the same way a vegan does, but vegans take it one step further and refuse non-food products that have used animal testing or animal products for its creation. That’s why some vegetarians may use products with beeswax or genuine leather, while vegans won’t. In short, all vegans are vegetarian, but not all vegetarians are vegan. Under vegetarianism, there are a lot of subsets which could also fall under veganism. Fruitarians, for example, only eat fruits, while raw veganism is the practice of eating vegetables in its natural form, uncooked. While it’s just my opinion, I don’t think ovo-vegetarians, lacto-vegetarians, semi-vegetarians, and pescatarians are real vegetarians. While the first two only eat eggs and milk, semi-vegetarians eat more vegetables than meat, and pescatarians only consume fish meat, these are still animal products. 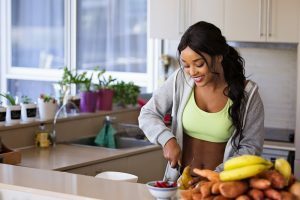 Vegetarians and vegans give up these food and non-food products completely for their diet, their beliefs, or just because it’s what they think is best for their body. While they do consume less meat, they’re still consuming animal products. While spaghetti squash is a vegan substitute for regular pasta, it can be eaten by both vegans and non-vegans. But for this article, we’ll be focusing on recipes that don’t include any meat products or by-products such as eggs and dairy. Contrary to what a lot of people think, going vegan doesn’t necessarily mean giving up dishes you like. You can still continue to eat food closely similar to it by replacing animal-based ingredients with vegan substitutions. These are flavorful non-animal-based ingredients that provide a similar flavor or purpose in the dish. Egg, for example, is used both for its flavor and its ability to become a binding agent for breading and other ingredients. Finding a replacement can be tricky in terms of its unique flavor, but as a binding agent, several vegan substitutes can suffice. One mashed banana provides a thicker binding consistency and adds more fiber to your mixture, while aquafaba (chickpea brine) acts very similar to egg whites. For vegan pasta dishes, you’ll even find substitutes for commonly used ingredients such as milk and cheese. You’ll find plenty of plant-based milk in grocery stores. Soy milk is the most popular, but I recommend almond milk, which tastes better for me. But it’s up to your preferences to find a substitute that works best. You’d be surprised what serves as cheese substitutes. Tofu cheese is common, since tofu has always been available to replace dairy products, but chefs have come up with some very interesting substitutes with similar flavors. Nutritional yeast, for example, tastes a lot like cheese, and adding it into any dish will give you a cheesy flavor. Soaking and blending cashews can create a creamy paste which, added with herbs, spices, and nutritional yeast, can make a good cheese spread of vegan lasagnas and other cheesy pastas. There are many reasons people choose to go vegan. While I don’t support PETA and their ways, I stopped consuming animal products because I realized animals had a right to live freely, not as something born and raised to be slaughtered for our gain. There are alternatives to honey body scrubs or leather shoes, yet millions are taking joy from the suffering animals go through. I don’t believe animals should be caged, suffering psychological and physical harm, and instead choose to support businesses that avoid these kinds of practices. Other vegans choose to switch for its potential health effects. Some research has shown the negative and unhealthy side effects of consuming too much meat. 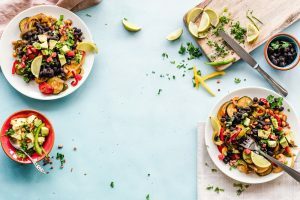 By eating more low-calorie, low-carb non-meat products, vegans greatly reduce the risk of heart disease, diabetes, cancer, and Alzheimer’s disease. Going vegan is a great way of shedding body fat and reducing your weight or body mass index. Finally, by going vegan, people get to contribute to improving the environment. Did you know that the meat industry is such a large contributor to global warming that the world has to cut their meat consumption by half if they want to avoid devastating effects in the next 11 years? That’s because there are so many cows bred for dairy and meat that their farts and burps are creating so much methane, contributing to air pollution via greenhouse gasses. There’s also so much water used to produce the meat we see in butcher shops and groceries. The water the industry uses is 43 times more than the water needed to provide the same amount of grain in our market. It’s much more environmentally friendly, therefore, to support vegetable and fruit businesses than it is to support corporations that deal in animal meat and animal products. Squash comes from the same family as pumpkins and zucchinis. It can be eaten raw, its seeds eaten, or cooked into several dishes. While wild squashes are dangerous for consumption, edible squashes are one of the first earliest plants to be domesticated in America before it was brought to Europe and the rest of the world. Squash is believed to be the mixed-result of a pumpkin and a zucchini. Yellow squashes are filled with nutrients and can help provide you with many health benefits. These are high in vitamins A, B6, and C – which can help your cognitive function, skin regeneration, and antioxidants – as well as folate, magnesium, manganese, fiber, riboflavin, phosphorus, and potassium. If you’re looking for vegetables packed in nutrients, carotenoids, and anti-inflammatory compounds, this is one of the vegetables you should consider. Spaghetti squash is basically a cooked form of squash. The squash is cut, washed, cleaned, and softened through heat before the insides are scraped intro strands that resemble spaghetti. 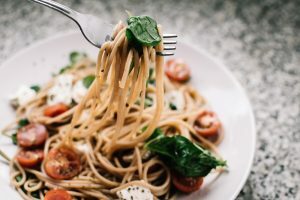 While you can try to make vegan spaghetti with flour, oil, and substitute egg, using squash as a spaghetti alternative is the more nutritious option. It also provides more flavors compared to the usual salty, floury pasta. How many calories are in a cup of spaghetti squash? Assuming you’re eating it on its own without any seasoning and added ingredients, it should have around 31 calories. A cup of regular spaghetti is approximate 221 calories. So, by eating spaghetti squash, you’re eating a fraction of the calories – over seven times less calories compared to regular spaghetti. Before shredding spaghetti squash, you need to soften the squash first through baking. You can cook spaghetti squash two ways: microwaving or baking. Microwaving is much faster, but putting your squash in the oven heats it thoroughly and gives it a caramelized, sweet but much deeper flavor. To start, you’ll need a medium-sized squash that’s around two to three pounds. Cut the squash in half from stem to tail. This is difficult to cut when it’s still hard, and some bloggers will say that it’s okay to microwave or bake the squash as a whole, but it will get difficult to clean the seeds out, so make sure to cut it or ask your grocer to cut it for you. Use a spoon to scoop out the seeds and then pat your halves dry with a paper towel. If you want the true squash flavor, leave it as is. Otherwise, drizzle your halves with salt, pepper, olive oil, and other herbs and spices you want. Squash can absorb the flavor while it cooks, giving you very flavorful strands throughout. From there, you have the choice to bake or microwave your spaghetti squash. For baked spaghetti squash, pre-heat your oven to 400 degrees Fahrenheit, line a large baking sheet with parchment paper, and lightly grease it with oil. Place the squash halves cut-side down on the baking tray. If you want to have more tender squash, pour a little water into your baking pan. Roast your squash in the oven for about 30 to 50 minutes, depending on how big your squash is. Be sure to check your squash after the 30-minute mark to gauge how much time you need. For microwaved squash, your microwave may not be big enough for both halves, so you may need to microwave each half one at a time. Place your halves in a microwave-safe container and add about an inch of water into the container before putting it in your microwave. Turn your microwave on high for about 15 minutes. If it’s still not soft enough, microwave it in 5-minute increments until it feels tender down the middle. In both cases, you can tell your squash is ready when you can pierce a fork through each halves and the squash’s meat easily shreds into spaghetti. Flip your squash over and use a fork to scrape out your “noodles.” Be sure to go lengthwise with your fork to get long squash strands. Store leftover spaghetti squash in an airtight container. You can keep it in your fridge for up to a week or frozen for up to three months. This may vary according to the dishes you make with spaghetti squash. Squash can absorb the flavor of your seasoning and spices while it cooks, which only compliments the natural squash flavor. After shredding your squash, you can eat it on its own without incorporating it into a recipe. It makes a good side dish or, sprinkled with vegan cheese substitutes a delicious snack to eat on its own. Like pasta, you know that there’s more pasta types than just spaghetti. 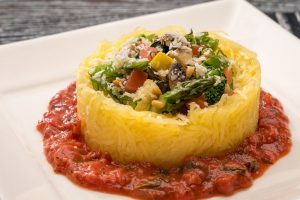 So, if you want to get creative with serving vegan pasta, try this recipe from Pasta-based called their “Spaghetti Squash Lasagna.” It’s just like making a regular lasagna, since the spaghetti squash can be molded into one layer of a lasagna. They even have a recipe for homemade vegan ricotta cheese using almonds and tofu. The result is 280 calories per serving, but that’s nearly four times the number of calories you would get from meat lasagna – which as about 350 up to 900 calories. 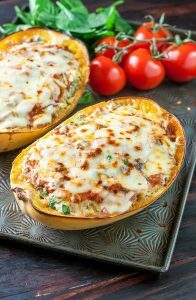 If you’re not the type who likes to waste perfectly good leftover squash skin, you might want to look at these vegan spaghetti squash recipes from Yummy Mummy Kitchen. Her creative recipes sound delicious and look appetizing and are all vegan-friendly! When serving spaghetti squash as a side dish or as a meal on its own, you’ll want to pair it with other food or drink that can work well with its flavor. For starters, if you’re going to eat it like a regular pasta with white or red sauce, you’ll want to eat it with a side of bread. Genius Kitchen offers a simple recipe for vegan bread. On its own, it would make a good side dish for salads, pad thai, or stuffed eggplant. Squash is already very flavorful, so try to avoid pairing it with other dishes with squash in it so it won’t seem too overwhelming. Who said vegan food is boring? Not only is spaghetti squash a delicious substitute for regular spaghetti, but it’s healthier and much more flavorful than your regular spaghetti dish. Feel free to get creative when making a spaghetti squash dish and don’t be afraid to try out new combinations.